My husband grew up in Hawaii on the Big Island in Kona. We are blessed that his parents still live there and we get to visit occasionally. The best part is we get all the ins and outs of where the locals like to go – the best beaches, the best hikes, the best restaurants. With three kids, going to restaurants is pretty darn impossible. So we tried the Lava Lava Club, which is a restaurant and bar that opens to an array of tables spilling out on the beach. So we could sit and have pupus (Hawaiian for appetizers) and cocktails while the kids played in the sand and water right in front of us. It was perfect. They served an exquisite Ahi poke with… avocados! Poke is a traditional Hawaiian dish consisting of raw salad served as a pupu. 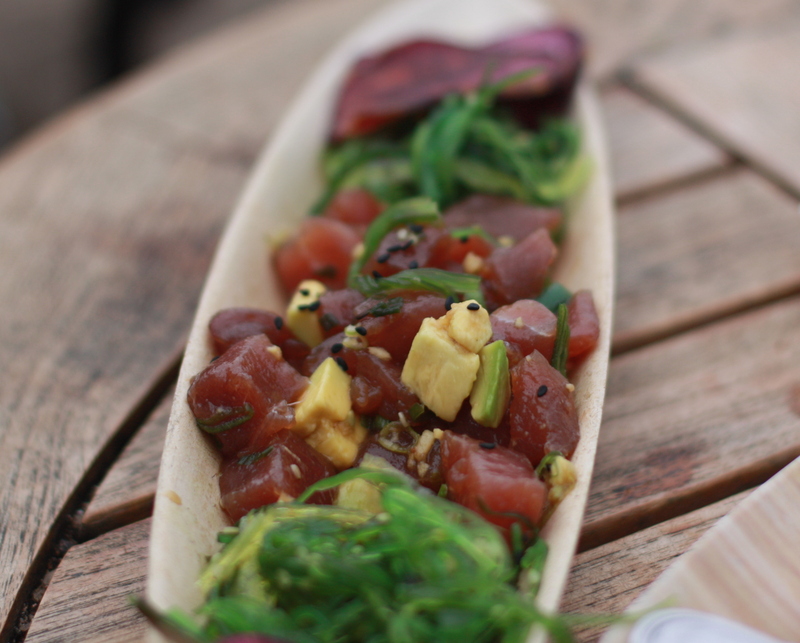 Poke can be made with any raw fish, but usually it’s made with Ahi (yellowfin tuna). I actually had not had poke with avocado before, but of course, it was delish. Below is a recipe adapted from several different ones from local cookbooks. None of them called for avocado, so I added it. The Lava Lava Club served the poke with fresh seaweed salad and sweet potato chips. Seaweed salad is available all over here, but it’s a little harder to find in the mainland if you don’t have a good Asian market nearby. I have found pretty good seaweed salad at Costco if you don’t mind getting a ton of it. In Hawaii, the sweet potatoes are purple. I have not seen them in stores on the mainland, but I am sure some specialty food shops somewhere must have them. If you can’t find them, substitute good ol’ orange sweet potatoes. Macerate ginger in soy sauce for at least 15 minutes in a small bowl. Meanwhile, cut the Ahi and avocado into 1/2-inch cubes. Finely chop green onions. In a large bowl, combine Ahi and avocado with green onions, red pepper flakes, and sesame seeds. Add more red pepper, or Sriracha red chile sauce (rooster brand), if you want more kick. Whisk sesame oil into macerated ginger sauce and then combine with Ahi mixture. Combine gently so avocados maintain their shape. Season with salt. Cover and refrigerate before serving. Meanwhile, preheat oven to 400 degrees. Slice sweet potato thinly for potato chips, 1/4-inch or less. This is easiest if you have a mandolin. Line baking sheet with aluminum foil and coat with canola oil. Place slices onto baking sheet, coating oil on both sides. Salt and pepper to taste. Bake for about 8 minutes, turn slices over and coat with more oil if necessary. Bake until crispy for another 7 minutes more. Drain on paper towel covered plate. 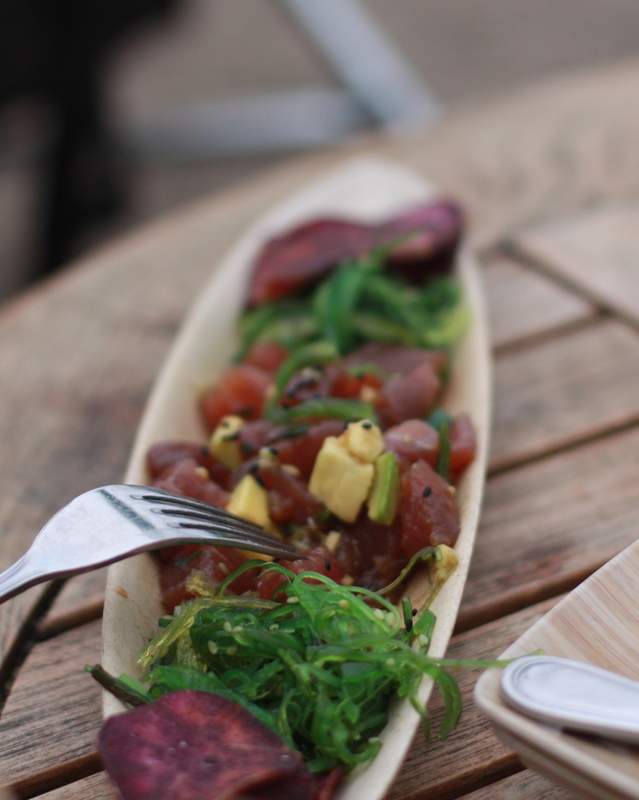 To serve, spoon some Ahi poke onto dish along with some seaweed salad and a few sweet potato chips. Recipe by Julie Ogilvie. Photos by Aaron Ogilvie. This entry was posted in Recipes and tagged ahi, avocado, Hawaii, poke, pupu, raw fish, recipe. Bookmark the permalink.